Signing off and toasting: To measuring blogging success with the metrics that matter! This means you have a goal for your blog. It’s to grow your business by growing your “know, like, and trust” factor with your audience. It’s to demonstrate your expertise and stand out online. It’s to use your blog as a content marketing machine to grow your subscribers and clients. If you blog for business, you need to measure success. 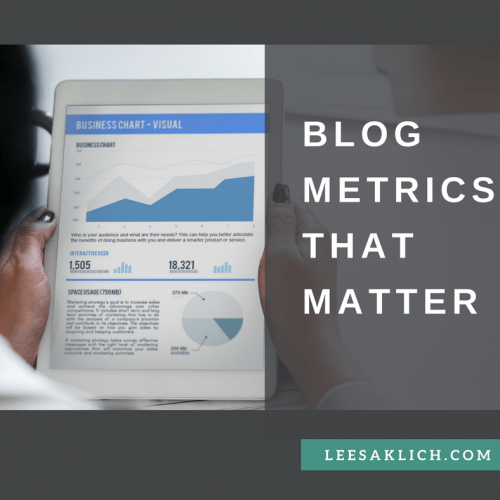 But, what are the blog metrics that matter? There are SO MANY things you can measure when it comes to your blog: traffic, comments, opt-in sign-ups, etc. What you can do to make it even more valuable. The first metric is the easiest – how much traffic does your website get overall. And you can break that down further to know how much traffic you get for each of your pages and posts? In Google Analytics you can find this by going to Behavior, Site content, All pages. These are important to know because if you know which of your posts and pages are the most popular, you’ll know to create more like those. This is especially useful if your blog posts are strategically planned to support your business, and give a free opt-in incentive to invite your readers to join your email list and potentially become clients. More on these below. You should run these numbers regularly, ideally weekly, to keep on top of what you’ve published that’s the most popular. The importance of looking at this regularly is because recent blog posts will have less traffic than older ones, but they can surpass them over time. It’s important to keep a pulse on what’s going on in your market because things can change quickly online. The two main things that entice people to click on your blog post are your headline and your image. To improve your headline you need to make it really catch the attention of your ideal clients. I listed a bunch of headline tools here. To improve your image you can find some great photos, use some branded graphic design skills, and make sure that image works for you as I outlined in this post. The scientific process is a way to do research and study things as objectively as possible. Not based on personal opinions, individual experiences, or philosophical positions. But on observations; or better yet, experiments. By conducting experiments. And making them as un-biased as possible (e.g. using control groups, double-blinding, statistically accounting for confounding variables, etc.) is how it strives for objectivity. Here’s one example how I use A/B testing – it’s for my email subject lines. I use ConvertKit (aff) as my email autoresponder program. They allow me to A/B test my email subject lines. To do this I enter two options (see image below). Then, when I send out the email, at first, it only sends it to 30% of my subscribers. One headline is sent to 15% and the other is sent to the other 15%. After four hours, it automatically chooses the bestter performing subject line and sends that “winner” to the remaining 70% of my email list. But, you DON’T need special software to do this! You can try things out with your social media followers! For example, you can poll your FB or Tw followers and ask them their opinion. Or better yet, send one headline out one day, and the other on another day. Then see which one gets more “likes,” clicks, and comments (also known as “engagement”). PRO TIP: Using polls are similar to observational nutrition studies. When you ask people what they like or ate (e.g. with a “food frequency questionnaire”) you will get results that are OK, but not as objectively accurate as possible. It’s better to do an actual experiment and try different headlines out. This is why I share when I come across some great new nutrition studies that are high quality experiments and not just observations, like the SMILES trial I shared on Instagram here. To test the effectiveness of your images, you apply the same principle! Make two images and share them on your social media channels on different days (or different weeks). See which images get more engagement. Do this every week, and when you start to see a pattern, start creating more images with the more popular look. When you get comments, good or bad, they’re a gift! They show you that your blog post caught someone’s attention and was (hopefully at least partially) read. Plus, the reader took the time to share their reaction with you and the rest of your blog readers. Even if they emailed you privately, it’s still a gift! Hearing what your readers have to say is a great form of market research for you. Listening to their thoughts in their words is perfect! I haven’t found a way to automate this (please share if you have, in the comments, of course!). You can log comments in your editorial calendar for each blog post. This will give you metrics to know which of your posts got the most comments, so you can have a closer look to review what exactly you did in that post that you can continue to do more of for future posts. Was the post more emotional, timely, personal, controversial, helpful, etc.? What was it that readers commented on? Whatever it was, do more of it! First of all, ask for them! At the end of all of my posts after my conclusion and “signing off” I have a section called “Over to you” where I ask specific questions to encourage a conversation with my readers. Another way to get more comments is to be more controversial. Hit topics hard with your point of view. If you’re so bold you can also use some of the emotions associated with virality: fear, disgust, and surprise. But PLEASE only do this for credible health information – people who spread fake health news use these emotions for their own personal metrics. You’re better than that, right? The trend lately is that more readers comment on blog post shares on social media, rather than directly at the bottom of the blog post itself. Have you heard “the money’s in the list?” Ya, it is! Statistically speaking, the more people on your email list, the more successful your online business will be. The entire premise of blogging is to use it as a foundation for all of your marketing – your newsletter, social media, etc. This is using content to market your business – content marketing. And one of the main reasons to write great blog content that will get views, comments, etc. is that it also collects email addresses from potential ideal clients. The easiest way to measure email list growth is to look at how many people join your email list over time. Even better, which blog posts are the most effective at getting people to opt-into your list. There a couple of ways to measure these metrics. I use ConvertKit to do this for me! I create specific opt-in forms that I embed in different posts or categories of posts. Yes! The same opt-in form can be duplicated, re-named, and used in different posts/categories of posts to track which post/category attracted which email subscribers. PRO TIP: Strategically categorizing your blog posts to align with your paid offer is genius when it comes to using your blog to build your business and do market research at the same time. One way to use categories is to have a “please confirm” and “thank you” page that your new subscribers are directed to for each category when they sign up. Then you can see the traffic to those pages. As you can see in my site stats image above, my “thank you” page is the fifth most visited page on my website. As it should be! This way, you can see which posts/categories are attracting the most email subscribers. Here’s how I’m working this: I have three main categories for my blog, each one links to at least one paid product/service. Then I linked an opt-in freebie to each category, along with a “please confirm” page, and “thank you” page. And I track all of these! 1 – Look at all of your current (and planned) paid offerings – products, programs, and services. Figure out how they help your ideal client and how they link together. For example, is one for people starting on their journey toward health and wellness, another for those farther along? Is one for one health goal, and another for a different one? Now create a name for each category of offerings. You probably should only have 2 or 3 in total – don’t spread yourself too thin! 2 – For each category of offerings, create an opt-in incentive specific to it. What is the first step your ideal clients can make that can bring them results in advance toward your paid offering? You will promote this opt-in incentive in each blog post in this category. PRO TIP: Make sure it is well-branded to you, has lots of links to your website, and has a bit about you and an invitation to purchase your paid offer at the end of it! 3 – Create a new “list” or “form” in your email autoresponder software so you can segment your subscribers based on which category they opted-into. 4 – Create a “please confirm” and “thank you” page for each of these categories. Set up an email for each to deliver that one opt-in incentive via those two pages on your website. 5 – Now that you have categories that lead someone from an opt-in incentive directly to a paid offer, you need blog post topics that invite them to see it! What topics can you create (or purchase) for each blog category that simultaneously helps your ideal client with awesome free information, and at the same time really showcases your expertise? I have two services called the “Health Blog Optimization Plan” and “Content Calendar Coaching.” I have these together in one category called “Strategy & Planning.” For this category, I have an opt-in freebie called “Ultimate Health Blogging Checklist.” This opt-in form is at the bottom of every single blog post in that “Strategy & Planning” category. When someone signs up with their email address to download a copy of the checklist, they get directed to a “please confirm” page that thanks them for their interest in strategy & planning for their health blogs – not a generic “please confirm” page. When they confirm in their email, they’re directed to a “thank you” page that thanks them for signing up and delivers the download to them – not a generic “thank you” page. At the end of the pdf download are promotions for my lower-priced offers like my Health and Food Awareness Dates Calendar and my VIP Health Blog Optimization Plan service. Then, I use my email autoresponder to take this one step farther (ConvertKit can do this!). 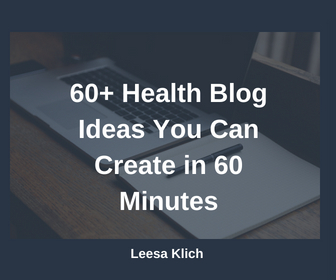 I create several opt-in incentives, including ones specific to a blog post (like the pdf summary download of this post on 60 health and wellness blog ideas you can create in 60 minutes). These are called “content upgrades” because readers can download an “upgrade” to the content they’re reading right now. Then, I make a new form for each opt-in freebie. This way I can “tag” a subscriber to see which forms they opted into. (This is why I moved to ConvertKit (aff)- it has great capabilities to A/B test headlines, and tag email subscribers without having to create an entire new list for each new opt-in). Start doing this based on your blog categories, even with the same opt-in. You can take this another step farther and create a new form or tag for every single blog post. Or even every position in every single blog post (e.g. the middle, the bottom). You can go crazy with tags for your subscribers – but these are GREAT metrics for all online businesses! Doing these gives you GREAT metrics to know what opt-in incentives in which position in which blog posts in which categories are the highest converting! Then, when you know which are the most effective, have a look at what makes those more appealing and make more of those! Ask! Make sure to have an opt-in form at the end of every. single. blog. post. No exceptions! Also consider adding an opt-in form on your sidebar, and as a pop-up or welcome mat too. Make sure that your opt-in offer, whether it’s an ebook or recipe guide, is relevant and bridges your post directly to a paid offer that you have. The content of the opt-in has to make sense for someone who reads the post to provide great information and help them take the first step toward a product or service you have. Better yet – it should help them get results in advance, so they become excited to work with you to see more and more results! Set up one opt-in offer that leads to one paid offer, and create one of these for each of your blog categories. Remember, make sure you have an email opt-in incentive in every. single. blog. post! They say what you put your attention on grows, right? So paying attention to the metrics that matter will help you to grow your blog and really use it to better get readers to become subscribers, and subscribers to become clients! This is part 1 of the series Blog Metrics that Matter – stay tuned for more advanced strategies (part 2: traffic over time)! Which metrics matter the most to you? Which ones do you already track? Which ones will you start tracking? Have I missed any critical ones (here’s part 2 all about traffic over time)?